Lately, I’ve been using Google Finance more and more as a place to keep tabs on individual stocks. It presents the basic information I need in an easy-to-read format on a single page, so I don’t have to click around much to find what I need. Even better: it’s a one stop shop for the basic information that a beginning investor would need when examining a stock. 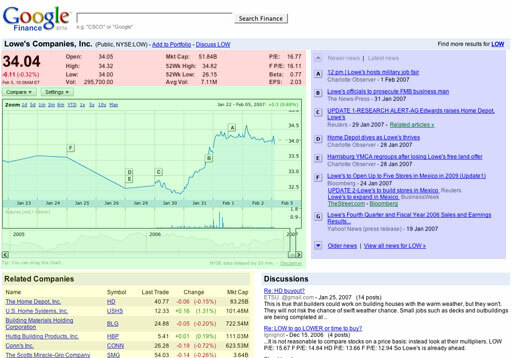 Below is a screenshot of the Google Finance page for Lowe’s (LOW) with some color coding on it so we can walk through the features. The P/E value is also known as the price to earnings ratio. Basically, it is the result of taking the current stock price (34.04, in this case) and dividing it by the earnings per share most recently announced by the company ($2.03 per share). The P/E ratio is the best number to use to compare stocks to others in the same sector, as this eliminates some of the major variations between companies (i.e., you can fairly compare McDonalds to Burger King using the P/E ratio, but their stock price isn’t a good comparison because one may have more stocks outstanding than the other, for example). The F P/E value is the forward price to earnings ratio, which is almost the same as above, except it uses projections of the company’s future earnings by stock analysts instead of the company’s announced earnings per share. In this case, the analysts are projecting about $2.11 per share in earnings the next time Lowe’s announces their numbers. Because of this, the forward P/E is lower than the normal P/E; forward P/Es are lower than normal P/Es in stocks where analysts expect the companies to make more money per share the next time they announce their earnings. The beta is a statistical model that estimates how closely the stock’s performance matches the stock market in general. The higher the beta, the closer the stock matches the general market. Blue chip stocks generally have a higher beta, whereas speculative stocks generally have a lower beta. Often, the lower the beta, the more risky the investment. The earnings per share was mentioned above in the P/E value; it’s merely the company’s last announced earnings divided by the number of shares outstanding. So, if a company makes a million dollars and has a million shares outstanding, their earnings per share would be $1. The green section is a chart that shows the stock’s price over time. The small lettered flags on the chart relate to the news stories over on the far right (the blue section) at the exact time the news broke. Below that chart is a smaller bar that indicates the stock’s performance over a longer stretch of time. You can move the bars on the lower chart to expand and contract the range of the upper chart; try it, it’s quite fun! The aforementioned blue section contains recent news stories on the company, including changes in analyst opinions on the company and also major business moves by the company. It’s a great place to start doing research on the company, but it’s far from a “be all end all” resource. The final section worth noting is the yellow section, which contains a listing of the top rivals of the company, enabling you to check out the numbers and performance of competitors in the same sector with just a mouse-click. The selection here is quite good, as Lowe’s shows their top rival, Home Depot, right at the top. This is a very strong resource for beginning stock investors who need basic information to begin understanding how to compare and contrast different stocks. While it’s not the be-all end-all of tools, it is certainly a healthy place to start your research.